The 33,000 sq ft Samsung Opera House in Bengaluru will host a number of experiences including - VR, home theatre, smart home, DeX, Bixby and more. 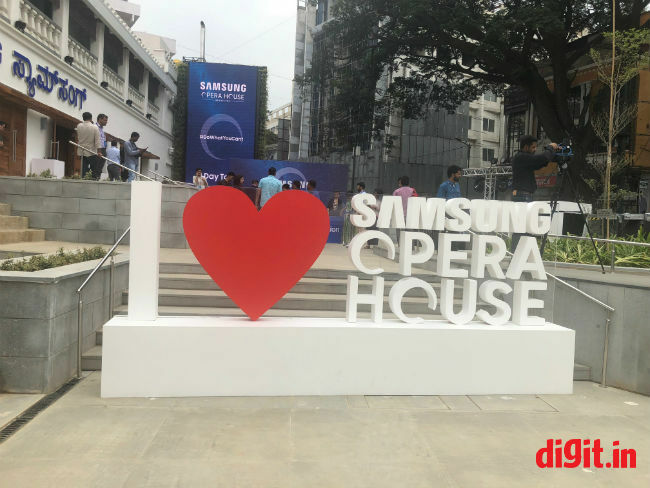 Samsung Electronics has opened what it claims to be the world’s largest mobile experience centre in the iconic Opera House on Brigade Road, Bengaluru. 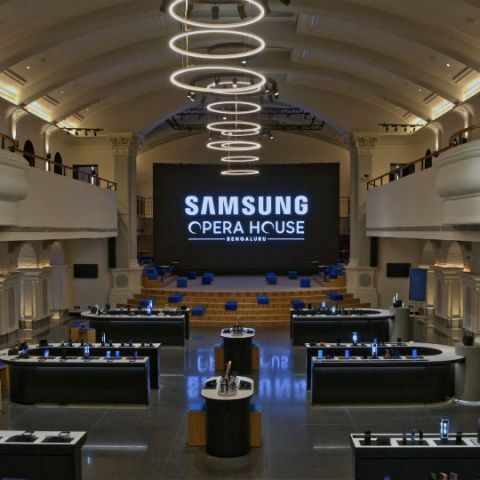 The South Korean giant says that the Samsung Opera House will be home to the company’s largest retail store in the world, with all its products and gadgets available to experience under one roof. Samsung says that the 33,000 sq ft standalone property, which hosted plays and Operas during the British era, has been restored over two years. Samsung will showcase its full lineup of smartphones and wearable devices at the experience centre alongside flagship consumer electronics products such as the QLED TV, Smart TVs, The Frame, and Family Hub Refrigerators, Washing Machines, Bluetooth Speakers and more. The idea behind the facility is to help consumers experience Samsung products first hand. The store will be run by trained Samsung employees who will guide customers through their purchases. The experiences in the Samsung Opera House will revolve around technologies such as Virtual Reality (VR), Artificial Intelligence (AI) and Internet of Things (IoT). 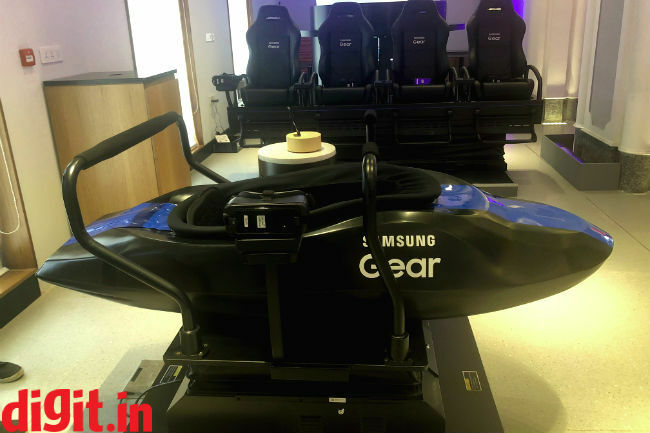 At the experience centre, customers can enjoy Gear VR experiences such as the 4D Sway Chair or the Whiplash Pulsar 4D chair that makes 360 degrees three-dimensional movements. One can slip into the role of a fighter pilot doing extreme aircraft stunts, or experience a space battle, or a roller coaster ride. Consumers can also pre-book the Centre’s home theatre zone for watching movies and shows in groups or head over to the store's gaming zone to indulge in multiplayer gaming on Samsung's beautiful curved gaming monitors. 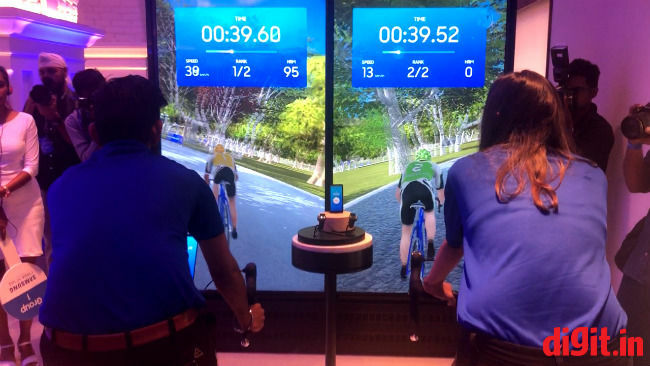 In addition, the Samsung Opera House also features a fitness zone wherein consumers can participate in virtual cycling races wearing Samsung's Gear Fit bands. “We have curated never seen before experiences that will excite people of all age groups alike. Opera House will also organize workshops, activities and events, bringing together Samsung’s innovations with people’s passions. We are proud of the transformation that this place has seen,” HC Hong, President and CEO, Samsung SouthWest Asia, said in a statement. Apart from the mentioned experiences, Samsung will also showcase accessories, including cases, covers and power banks in the centre. Consumers can customise skins for their devices for screen protection and 360 degree body protection. There will also be a range of Harman Kardon, JBL(both now owned by Samsung) and Samsung audio products, sold in the store. The Samsung Opera House will also have a customer service centre. Samsung says that it plans to expand its reach to other metropolitan cities, and has a target of opening 10 such stores in India. According to Mohandeep Singh, Senior VP, Sales and Retail Marketing, Samsung Mobiles, "Samsung is scouting for more space and locations in different metro cities to execute similar projects. These stores will also conduct innovation workshops, talks for startups, musicals, standups and more." When asked if Samsung's sudden push towards big experience centres is a result of upcoming retail competition from Apple, Xiaomi and Huawei, Singh told Digit, "These things cannot be planned by looking at competition. Where we've reached versus how the market has evolved, those are the basis on which we decided this. When we started the project, the shape or the size of the competition was very different than what it is today. There are two trends from the consumer side which are very strong. On one side, the consumer wants convenience, but equally important and strong trend is that consumers are not happy with just box selling. Consumers expect integrated experiences and want to understand technology more intimately, which is what offline retail can offer." Singh also told us that the majority of Samsung smartphone sales still occur in the offline market and for Samsung, retail is the third biggest focus area for investment in India after manufacturing and R&D. Samsung opened this experience centre in less than two months after it inaugurated the world's largest mobile manufacturing factory in Noida. In India, Samsung has two manufacturing facilities, five R&D centres and one design centre. Samsung’s first R&D centre was set up in 1996 in Bengaluru. The company claims that Samsung R&D Institute, Bengaluru (SRI-B) is its biggest R&D centre outside Korea. Samsung has over 180,000 retail partners and 2,100 Samsung brand stores in the country.